Amish furniture in California? Though their best-known community of Lancaster County lies 3,000 miles east, a number of Amish furniture outlets in California provide Amish furnishings and home decor for Golden State residents. Our directory lists twenty of them below, located from north to south across the state. Amish furniture ranges from bedrooms to children’s furniture to outdoor tables and chairs. Pennsylvania Dutch craftsmen make high-quality furniture in a range of styles and woods including oak, cherry, maple, and walnut, and the popular Shaker, Mission, and Queen Anne’s designs. Whether you live in Los Angeles, San Francisco, San Diego, Sacramento, Anaheim (or elsewhere in Orange County), you’ll find an Amish furniture dealer within easy driving distance. Now featuring furniture from three Amish producers. Curios, bookcases, sofas, chairs, office suites, dining room tables, and more. Moved from previous Orange, CA location. Amish oak furniture including bedroom and dining room pieces. Tables, china cabinets, bedframes, armoires, and more. North LA area. Northern California dealer of a variety of furniture producers including Amish. Retailing Amish log furniture from Montana Woodworks. Selling a range of Amish Mission-style products. Greater Los Angeles area. Amish furniture made in the Midwest, including dining and pub sets, available at this Long Beach location. Flooring company carrying the products of at least one company with Amish ties (Homerwood). Carrying Daniel’s Amish Furniture among other lines. Carries a handful of items from the “Simply Amish” furniture brand. Two locations. Selling multiple lines of Amish-built furniture in Central California. Selling the Amish Crafted by Noah Bontrager line. Amish made desks, bookcases, chairs, bedroom collections, and more. Bay Area. Large Bay Area selection of Amish made furniture items. Store located 45 min north of San Francisco. Items from the Simply Amish manufacturer. Northern California seller of Amish furniture. Full gallery of Amish-made bedroom furniture. N. California. “Made to Order” Amish furniture in northern CA. For Amish furniture outlets in other states, check the Amish Furniture Guide main directory page. Note to California residents: Please be sure to check opening hours of any Amish furniture businesses listed in this guide before traveling long distances. While we strive to keep this directory up-to-date, business locations and schedules can change. Not responsible for changes to information. Through its long history, California has seen only one, brief Amish settlement, a small community located near Salinas in Monterey County in the 1910s. Though finding the nearest Amish requires a trek of hundreds of miles, fine handcrafted Amish furniture can be found at a number of convenient locations throughout the state. Amish consider pride a sin. But Amish do take satisfaction from work well done. Creating quality furniture comes naturally for a people that follow the “Do unto others…” Biblical lesson. Amish furniture has enjoyed a longstanding reputation for durability and quality. Amish make a wide range of furniture styles and items for every room of the home, from the dining room to the kitchen to the bedroom and children’s room. Amish use a range of hardwoods to produce their furniture, including oak, walnut, maple, and cherry. Styles of furniture include classics such as Mission, Shaker, and Queen Anne, as well as more contemporary styles. 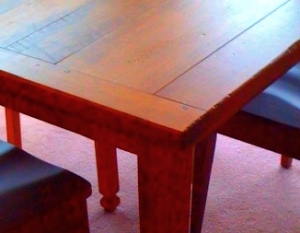 Amish craft their furniture with a variety of tools and technologies. Some Amish furniture shops use hydraulic or pneumatic power to drive their equipment, while others rely on diesel generator-powered drive shafts moving belts and pulleys which in turn power shop equipment. Handcrafted pieces get their final treatment in Amish finishing shops, where coats of stain are meticulously applied by specialists trained in the art. For the Amish, another important aspect of furniture-making is family. Amish have long lived and worked on farms. This agricultural heritage has allowed Amish families to stay together, rather than dispersing to distant workplaces. Farming has provided children with many opportunities to develop a strong work ethic. Close bands of farming families naturally work together, building Christian community. Amish have big families, which can create challenges. With an average of seven children, it is difficult to find enough land for all sons to have a farm. So many Amish have begun opening shops–furniture makers, cabinet shops, other wood businesses, as well as buggy shops, quilt makers, and others–a business phenomenon that has been occurring over the past 3-4 decades. 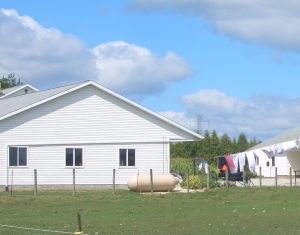 The furniture shop is ideal for Amish in that it is similar in some ways to a farm. An Amish woodworking family is together or in close proximity most of the day, just like on the farm. Rather than working out in a factory, an Amish father is at home where he can give his children guidance. In the eyes of many Amish, furniture-making has become a good substitute occupation, one which helps preserve family and community. Do Amish live in California? As mentioned above, one community of Amish did briefly exist in California in the early 1900s. Despite California’s title as America’s largest agricultural state, no Amish have been attracted to settle there since. Two-thirds of all Amish live in Ohio, Pennsylvania, and Indiana. But in recent years Amish have been moving West. Amish have founded settlements in Montana, Colorado, and Kansas. A recent scouting trip examined Alaska as a possible destination. Who knows? Maybe one day the Golden State will be home to its own population of Amish furniture craftsmen. Until then, California residents can find high-quality Amish-made furniture at a variety of sources, including CA Amish furniture retailers, as well as online Amish furniture sellers. Do you have representatives in the San Francisco Bay Area? www.simplyamish.com has dealers in your area. This is Amish Furniture made in Illinois. Do you have any stores in california that sells you items? Google simply amish and put your zip code in. There is at least one store in San Francisco. do you make table/chairs for 10? The idea of a community endeavoring to live in imitation of the Biblical ideal, i am sure gives our Father joy. some of us use koine greek, hebrew, chaldee and english rather than alt deutsch and pa dutch….. but we all try our best to live HIS WAY…..
your example is much needed in this vale of tears.